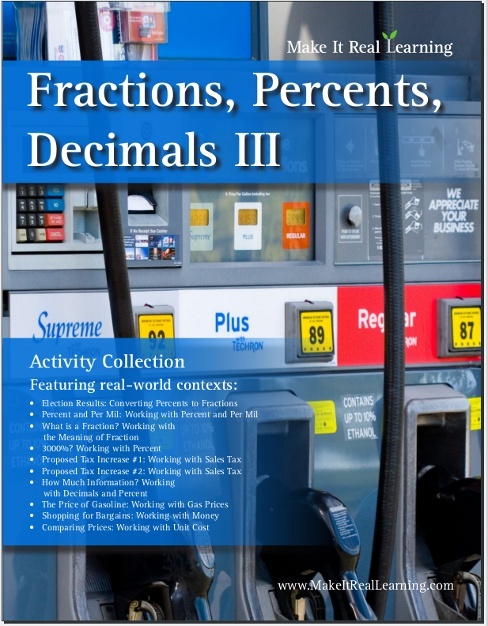 The Make It Real Learning Fractions, Percents, and Decimals III workbook focuses on real-world situations that may be effectively analyzed using fractions, percents, and decimals. This book suits best grades 4-7. From figuring out increases in prices when the sales tax increases to analyzing a slip of a tongue of "3000%", learners get to use basic math skills in meaningful ways. Each activity integrates real world information, companies, and issues (e.g. per mil, sales tax increases, price of gasoline, unit prices), not just "realistic" data. Converting Percents to Fractions Write percentages as simplified fractions. Interpret these fractions as ratios, relating them to the context. 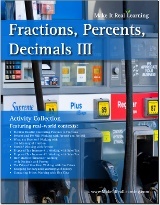 Working with Percent and Per Mil Explain what different percent and per mil amounts mean in various contexts. Express per mil amounts as percentages. Working with the Meaning of Fraction Explain a meaning of a fraction in a real-world context, such as 3/4 cup of brown sugar or 1/8 of a dollar. Working with Percent 3000% drop in healthcare premiums was a slip of the tongue. What would it really mean? What is the reality? Working with Sales Tax How much does an increase in sales tax actually increase the prices? Compare prices given two different sales taxes. Percent increase of the sales tax versus percent point increase of the sales tax. Working with Decimals and Percent Calculating percentages of a total. Calculating and using percent increase. Working with Gas Prices Analyzing how much of the price of gasoline comes from different sources, such as taxes or the price of crude oil. Using tenth of a cent. Working with Money Calculating sales prices. Calculating a price before a discount. Working with Unit Cost Calculating unit prices.